Rebecca Ribchester was born in the UK in 1984. She began her formal training at Wells Cathedral School with the assistance of a British Government DfFE scholarship. In 2002 she was awarded the Oliv Zorian Scholarship to study at the Royal Northern College of Music (RNCM) with Richard Ireland, and graduated in 2006 with a first class honours degree and a high distinction. Whilst a student at the RNCM, Rebecca won major prizes for solo and chamber music. 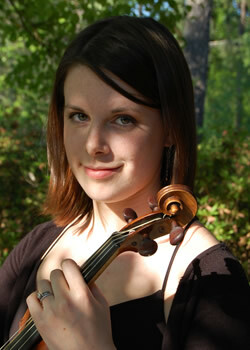 As a soloist, Rebecca has performed in the UK, Europe and North America as both a sonata partner and concerto soloist. Recent performances have included recitals as part of the concert series at St. George's Brandon Hill and Music at Park House, Cheltenham. In 2004 she participated in classes at the EAMA summer school at La Schola Cantorum, Paris. Rebecca has taken masterclasses with Emanuel Hurwitz, Atis Bankis, Yfrah Neaman, Hugh Bean and Marianne Thorsen. In 2006 she was awarded the Joanna Scott Foundation Scholarship, which allowed her to purchase a violin by Glen Collins. In 2007 she will give the Philadelphia premiere of a new violin concerto written by Matthew Schreibeis with musicians from the Curtis Institute of Music. Rebecca studied the art of chamber music with members of the Fitzwilliam, Lindsay and Endellion quartets. In 2002 she was invited to perform at the opening festival of the Commonwealth Games and played at the centenary celebrations of Prokofiev (2005) and Shostakovich (2006) in Manchester. In 2005, she was invited by conductor Martyn Brabbins to join the Cheltenham Festival Academy, an ensemble comprised of outstanding students from UK conservatoires. Rebecca is an experienced orchestral musican and has held concertmaster and associate principal positions in the Britten Pears Orchestra (UK), Internationales Jugendsinfonieorchester Elbe-Weser (Germany) and the RNCM Symphony, Chamber and Opera Orchestras. She has worked with conductors including Alexander Polianichko, Oliver Knussen, Paul Daniel, Enrique Mazzola and Gianandrea Noseda. Rebecca has performed for BBC television and radio. A versatile and creative musician, Rebecca is committed to the performance of new music. She has given many premieres of new works by young British and American composers and has included her own compositions in recital programmes. Rebecca has worked with composers Markus Stockhausen, Huw Watkins and Jonathan Harvey and enjoys working with electronic and experimental techniques. As a compliment to her interest in contemporary music, Rebecca is an active baroque violinist. She studied baroque and classical violin with Pauline Nobes (Academy of Ancient Music) and has performed with members of The Bach Players (Netherlands) and I Fagiolini (UK). Since 2007 she has played with Tempesta di Mare (Philadelphia Baroque Orchestra). Rebecca currently lives in Philadelphia, where she works as a freelance violinist.